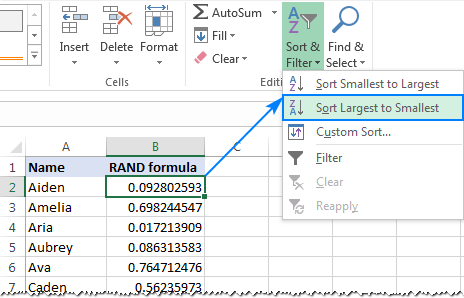 The tutorial will teach you two quick ways to randomize in Excel: perform random sort with formulas and shuffle data by using a special tool. Microsoft Excel provides a handful of different sorting options including ascending or descending order, by color or icon, as well as custom sort. However, it lacks one important feature - random sort. This functionality would come in handy in situations when you need to randomize data, say, for an unbiased assigning of tasks, allocation of shifts, or picking a lottery winner. This tutorial will teach you a couple of easy ways to do random sort in Excel. 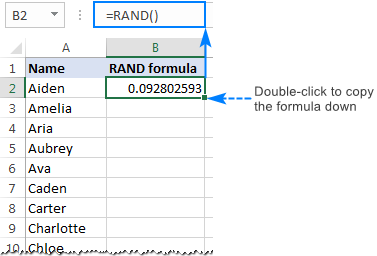 Although there is no native function to perform random sort in Excel, there is a function to generate random numbers (Excel RAND function) and we are going to use it. Insert a new column next to the list of names you want to randomize. If your dataset consists of a single column, skip this step. Sort the column filled with random numbers in ascending order (descending sort would move the column headers at the bottom of the table, you definitely don't want this). So, select any number in column B, go to the Home tab > Editing group and click Sort & Filter > Sort Largest to Smallest. Or, you can go to the Data tab > Sort & Filter group, and click the ZA button . Excel RAND is a volatile function, meaning that new random numbers are generated every time the worksheet is recalculated. So, if you are not happy with how your list has been randomized, keep hitting the sort button until you get the desired result. 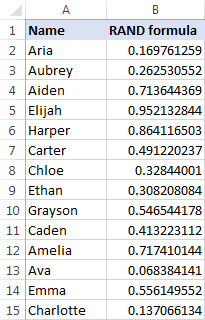 To prevent the random numbers from recalculating with every change you make to the worksheet, copy the random numbers, and then paste them as values by using the Paste Special feature. Or, simply delete the column with the RAND formula if you don't need it any longer. The same approach can be used to randomize multiple columns. To have it done, place two or more columns side by side so that the columns are contiguous, and then perform the above steps. 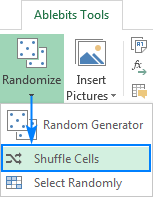 If you don't have time to fiddle with formulas, use the Shuffle Cells tool included in our Ultimate Suite for Excel to do a random sort faster. Head over to the Ablebits Tools tab > Utilities group, click the Randomize button, and then click Shuffle Cells. 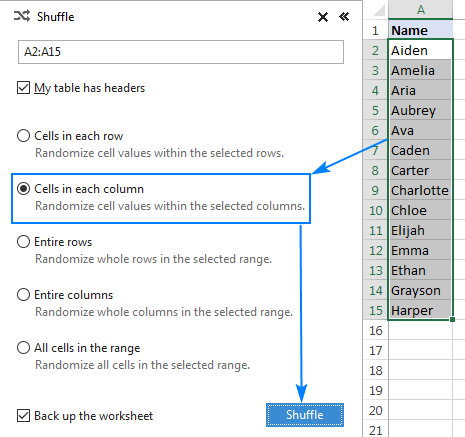 Cells in each row - shuffle cells in each row individually. Cells in each column - randomly sort cells in each column. Entire rows - shuffle rows in the selected range. Entire columns - randomize the order of columns in the range. All cells in the range - randomize all cells in the selected range. 2 Responses to "Random sort in Excel: shuffle cells, rows and columns"
Thank you so much! I knew there had to be a way to randomize a list in Excel. I never would have come up with this on my own! the running ticker at the bottom of the site is incredibly distracting and makes it almost unusable. I use it ONLY if I can't find the answer on another site.